The Department of Art and Education provides multifaceted education from practical creative activities to theoretical research on topics including the educational role of art and aesthetic human development. In practical creative activities, the Department seeks to raise the level of each student’s specialized skills as practitioners while broadening their perspective of artistic expression. At the same time, students undertake research to deepen their theoretical understanding of artistic creation, examining issues such as the ideas at the root of expression and the essential role of art in human development. The Department are also promoting the interdisciplinary links with other fields such as medicine and welfare. Since 2007 the half part of the Department of Artistic Anatomy has joined us. Since its founding as an independent graduate course in 1963, the Department of Art and Education has turned out a number of excellent artists, educators, and researchers who are active in a wide range of fields such as universities, schools, art museums and so on. Master: The aim is to expand research in the field of one’s specialized practical skills and conduct theoretical research based on the problem(s) of one’s individual research. While studying the relationship between education and fine arts through the theory of materials and construction, including the theory of Art and Education, the students deepen their individual perspectives about Art and Education through theory and creative work. Furthermore, the students present their research achievements in their project-oriented study. In the first year, the students decide their research themes, and in the second year, the students concentrate on the Master’s thesis and creative work. Doctor: In the doctoral program, individuals who have obtained the Master’s Program degree work toward further advancing their research. While expanding their expertise in their specialized area through production research, students also focus on theoretical research through field surveys and conference presentations, oriented towards writing academic papers. Through creative work and theory, students establish their perspectives on Art Education and communicate them to society through the practice and research of the importance of art education. Master: The Master’s degree is awarded once the abovementioned curriculum policy has been fulfilled, the stipulated credits have been acquired, and the completed work is exhibited at an exhibition of completed creative works in their final year. Furthermore, a presentation must be made about the thesis at the Master’s thesis presentation. Both works will be reviewed and evaluated as suitable for receiving the academic degree. Doctor: The doctoral degree is awarded once the abovementioned curriculum policy has been fulfilled, the stipulated credits have been acquired, the exhibition of the completed work and the public presentation of the doctoral thesis is conducted, and once the individual has passed the review and final examination conducted by the Thesis Review Committee comprising a supervisor in the concerned research field and teaching staff in related areas. The specialized fields of practical techniques studied by students in the Department of Art and Education cover a wide range of genres, including Japanese painting, oil painting, prints, sculpture, crafts (metal hammering, ceramics, woodworking, and textile arts), and installations. Students pursue both their creative activities and theoretical researches from broad-ranging perspectives. About the academic requirements, students complete the task of submitting practical works of arts and a dissertation paper for their graduation. In the following course subjects, students investigate both practical techniques and theory. 1. Theory of Art and Education: Students learn the basic theory underlying artistic education and deepen their own understanding of the artistic activities. 2. Materials: Treating various artistic elements as materials, students consider the relationship between art and human beings from various perspectives, thereby deepening their thoughts on art and education. 3. Composition: Various topics are explored, including the philosophy of the artist in creating works of art and methods for giving them practical form. 4. Research themes: Students report the results of their theoretical research based on their own understanding of the issues, and pursue more in-depth research through the exchange of various opinions on these topics with other students and instructors in the Department. The Department of Art and Education is home to international students with a deep interest in art and education. A number of these students have also obtained masters and doctoral degrees. The Artistic Anatomy program was launched soon after the founding of the Tokyo Fine Arts School. As a field of study with a long history dating back more than 100 years, instructors of the program at the Tokyo Fine Arts School have included Ogai Mori and the painter Kei’ichiro Kume. Artistic anatomy is the discipline of studying the skeletal and muscular structures of the human body and using these studies in artistic creation and research. Based on the motto that art is the study of nature, it seeks hints toward creativity in the human form. Its goal is to develop a thorough understanding of the form and structure of the human body through means such as examining bones and observing living creatures. Artistic anatomy, long an academic discipline, also serves as the generative force underlying the creation of new art. The Artistic Anatomy Course proceeds along a course of study motivated by this conviction. 1．In the Master’s Program, students enroll themselves in special lectures and seminars pertaining to their research area, as well as in other special lectures and seminars, and acquire advanced specialized knowledge and research skills. 2．In the Master’s Program, students present their individual research achievements as per their project study and acquire presentation and discussion skills essential for researchers. 3．In the Master’s Program, students are required to complete the Master’s thesis and place their own research within the specialized field. 1．In the Doctoral Program, students enroll themselves in special lectures and seminars relevant to their research area, as well as in other special lectures and seminars, and hone their advanced specialized knowledge and research skills. 2．In the Doctoral Program, students are required to proactively conduct thesis presentation and research presentation, narrow down the research achievements within the specialized area, and acquire skills to become an independent professional. 3．In the Doctoral Program, students are required to acquire a broad range of knowledge and liberal arts perspective(s) in not only their specialized area but also other relevant areas. 4．In the Doctoral Program, students are required to improve their research capabilities by themselves, and subsequently, guiding toward the successful completion of the doctoral thesis. 1．In the Master’s Program, it is essential that students are enrolled for the stipulated period, attend all lectures specified in the curriculum policy, and acquire the required credits. 2．In the Master’s Program, students submit the Master’s thesis and can obtain the Master’s degree. The Master’s thesis must have originality, logical integrity, should adopt a research methodology that is appropriate for the research theme, and must accurately investigate and survey the research trends. The Master’s degree is awarded once the Master’s thesis has been assessed by the Thesis Review Committee. 1．In the doctoral program, the student must be enrolled for more than the stipulated period, be enrolled for all the lectures specified in the curriculum policy, and acquire the necessary credits. 2．In the doctoral program, the students submit the doctoral thesis and can obtain the doctoral degree. The doctoral thesis must have a high level of originality that contributes new knowledge in the concerned specialized field. The doctoral degree is awarded once the Thesis Review Committee has assessed the doctoral thesis, the Studio Committee has granted approval, and the thesis has been judged as competent. Further, public presentation and final examination are a compulsory part of the degree review. Artistic Anatomy A and Artistic Anatomy B are provided for students enrolled within any of the major courses within the Faculty of Fine Arts. While elective courses, they are attended by large numbers of students. Artistic Anatomy A provides an introduction to this field. In the first semester, students study the human skeletal structure; in the second semester, they study subjects including the muscular structure and the body surface. In Artistic Anatomy B, students study applications including the forms and skeletal structures of non-human creatures, based on the human form. They also study plants and various other natural forms. Students who wish to pursue further studies in artistic anatomy can advance to graduate school. Graduate students in the artistic anatomy studio come from a wide range of backgrounds, ranging from those who majored in practical techniques of painting, sculpture, and other art forms as undergraduates to those who studied theoretical subjects such as the science of art. Students in the master’s degree program study more specialized, advanced artistic anatomy in lectures, seminars, and dissections. Lectures cover various topics, including macroanatomy, morphology, and observations of living creatures, as well as research on the expression of the human body in the history of art and various techniques of expressing form. Students also observe the natural environment on visits to locations including sea and forest settings. They also visit artistic sites in tours of art museums and travel to research ancient art. The goal is to deepen understanding of art by learning about nature and the classics. On departing from graduate school, students submit theses. Ideally, organizing in words their thoughts and experiences concerning art will empower students in both research and in the creation of works of art, by clarifying their stances concerning art. In the doctoral program, students are expected to select more specific research themes. To help prepare for their doctoral theses and to complete original and highly complete research, students attend individual lectures and seminars. Following graduate school, students advance along various paths, becoming university instructors with expertise in artistic anatomy, applying their specialized knowledge at facilities such as art museums and galleries, or working as artists and designers. 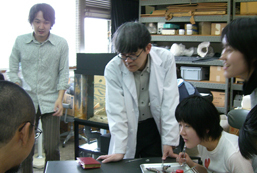 The university’s artistic anatomy studio is the only studio in Japan in this field with graduate students, and relatively few other such studios exist elsewhere in the world. For the future, the program intends to seek out students from overseas in order to extend its network of alumni to students not just from Japan but from around the world. This research field was established to contribute to the conservation of cultural assets by fostering specialization in techniques for and research into the conservation and restoration of cultural assets and research related to such conservation and restoration. It represents one of the two major fields making up the Department of Conservation, an independent program within the Graduate School of Fine Arts. In 1964, a class in techniques related to the conservation and restoration of cultural assets was established within the university’s master’s degree program. This was expanded and reorganized in 1995 into the Department of Conservation. The fields of conservation and restoration included in the program consist of studios in Japanese painting, oil painting, sculpture, crafts, and buildings. Students study and research restoration techniques in each of these areas, as well as examining and pursuing research on materials and classical techniques. Since the establishment of the doctoral program in 1977, numerous students have obtained doctoral degrees through this program. In this studio, students learn traditional techniques through practical hands-on training in reproduction and restoration techniques and the mounting of classical paintings. In the doctoral program, students examine topics from the perspectives of a wide range of fields, including the academic disciplines of the natural sciences and art history, as part of the process of research on reproduction and research intended to elucidate techniques and materials. 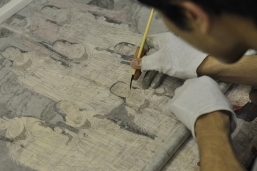 The goal is to develop graduates capable of serving in guiding roles through such research on the restoration and conservation of Japanese paintings. In this studio, students study techniques and materials for tasks such as the restoration and examination of oil paintings and the reproduction of classical paintings. The studio has also recently pursued work in the area of restoration of works created on paper, including sketches and prints. Elements of restoration draw on a wide range of disciplines, including recording technologies, optical studies, pigmentation analysis, and art history. The goal is to develop graduates capable of working in the conservation and restoration of cultural assets based on a keen and comprehensive understanding of artistic issues obtained through practical hands-on training and lectures. In this studio, in addition to studying specific restoration techniques, students pursue research on clarifying production techniques as well as preserving them. Keeping in mind at all times the fact that cultural assets produced from the cultural climate of the country play a fundamental role in the spirit of the Japanese people, the studio puts into practice efforts intended to pass on cultural artifacts and the spirit in which they were created with the utmost respect for the culture and creations bequeathed by our ancestors. Materials and techniques employed by cultural assets in the area of crafts are diverse and multifaceted. Since such works are created using these materials and techniques either individually or in combination, the studio sees accurate information on each as essential. 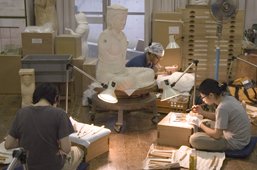 The studio provides training to develop restoration researchers and technicians (both in Japan and around the world) in various areas of craftwork, including research on techniques conducted through practical training in restoring and duplicating work, and research on conserving and restoring craft cultural assets based on the characteristics of cultural assets from each period in history, encompassing aspects such as composition, expression, and traditional techniques. In this studio, students become familiar with the skills needed to conserve and use historical buildings, including the repair of cultural assets, through practical training in the history of construction techniques, restoration techniques, investigation and evaluation, restoration planning, and surveying and drafting practice, thereby learning techniques for restoring wooden structures, which in Japan have evolved to highly advanced forms. Through their own studies and research based on these foundations, students become familiar with the ways of thinking and methods suitable for the highly individual nature of cultural assets. Master: The goal is to nurture professionals who contribute to the preservation of cultural assets through education and research related to the preservation and restoration of cultural assets, conservation science, and preventive conservation studies. Conservation and restoration of Japanese painting, oil painting, sculpture, crafts, buildings, and education and research related to restoration techniques including classical restoration techniques in each field is conducted. Conservation Science consists of cultural assets measurement science, fine arts and crafts Materials Science, and education and research are conducted in each area. Preventive Conservation consists of the Environment Conservation Program and Materials Science Program, and respective education and research are conducted. For Conservation and Restoration, Conservation Science, and Preventive Conservation, students make presentations related to the degree application in their final year. Doctor: The doctoral program develops the Master’s curriculum to a higher level of research and nurtures professionals, who possess practical, creative, and leadership skills and who also contribute to the conservation of cultural assets. Research guidance that reflects the achievements of the latest academic research in various specialized fields is conducted to nurture gifted researchers who can contribute to society. For each of Conservation and Restoration, Conservation Science, and Preventive Conservation, students make presentations related to the degree application in their final year. Master: The Master’s degree is awarded once research results are reviewed by the Thesis Review Committee comprising of a supervisor of the concerned research field and teaching staff of related fields, and it is assessed that the Master’s curriculum policy has been fulfilled. Doctor: The doctoral degree is awarded once the research results have been reviewed by the Thesis Review Committee comprising the supervisor of the concerned research field and faculty of related fields and it is assessed that the doctoral curriculum policy has been fulfilled. This program seeks to achieve mutual exchange between students with different undergraduate majors and from different universities through the common study of various topics, including the basics of each specialized field as well as an overview of cultural assets conservation, the theory of conservation-related environmental planning, conservation practice, and travel to research ancient art. Students are required to prepare master’s theses and doctoral theses for the corresponding degree programs; in addition, they undertake efforts such as creating reproductions and replicas and restoring works, based on their own areas of specialization. All students are required to make oral presentations and to exhibit the results of their research; each student is trained in both presentation skills and in communicating the results of his or her research to a broad audience. Students are required to complete courses in the conservation of cultural assets, the theory of conservation-related environmental planning, and conservation practices to familiarize themselves with basic knowledge related to conservation and restoration. In addition, they develop the skills required for conservation and preservation by studying traditional methods and techniques, testing and developing their skills by creating reproductions and replicas of and restoring works. In each research domain, each student pursues his or her own research theme. Building on skills accumulated in the master’s degree program, students pursue a broad range of work from various perspectives in preparing their doctoral theses. Employment as university faculty, at educational institutions, restoration studios, art and other museums, local public agencies, research institutes, publishing companies, and advertising agencies. The Conservation Science studio got its start as the crafts sciences studio in the 1920s under the Department of Crafts. After evolving over time into a materials research studio, in 1966 it was granted the status of a graduate-level program. In 1995, Conservation was established as an independent program encompassing the fields of Conservation, Conservation Science, and Preventive Conservation. 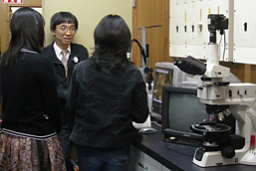 The field of Conservation Science is further subdivided into the studios of Analytical Science and Materials Science. Conservation Science seeks to contribute to the conservation of cultural assets, drawing on scientific methods to understand the materials used in works of art and crafts and to study their properties as well as deterioration. The field is broad-ranging, covering areas and materials such as metals, dyeing and weaving, oil painting, Japanese painting, ceramics, antiquities, and paper. With ties to the studios of the Department of Conservation, it proactively develops technologies, including technologies in the areas of X-ray imaging, analysis of paint pigments, and copying and replication materials. Through research like that described above, the department seeks to develop in students the capacity to work in this field and to cultivate an interest in a broad range of aspects of conservation, producing outstanding individuals capable of serving as leaders in the field of conservation. Past and current students include graduates from other universities – not just graduates with science degrees, but those with degrees in the humanities. The latter group accounts for roughly half of the student enrollment. 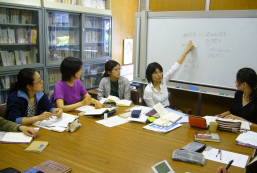 The department also includes numerous non-Japanese students. The department provides training and research guidance under a structure consisting of two full professors, one associate professor, and four (part-time) educational assistants. It also seeks to invite specialists from overseas to teach courses and to provide research guidance in English. Given its goal of training specialists in the field of conservation science, the department has developed a curriculum based on a broad-ranging perspective. In addition to study in the conservation science studios, students learn the fundamentals of other restoration fields and are encouraged to interact with students in other fields. Through this process, they identify their themes of interest and collect and announce the results of their studies over two years, culminating in a master’s thesis. Recent student research topics have covered a broad range of areas, including research into the archival qualities of traditional Japanese paper; analysis of materials used in cultural assets composed of metal and corrosive substances; research into the coloring materials used in textiles; elucidation of the mechanism by which oil colors deteriorate; and research into how and why the coloring materials used in ukiyo-e degrade over time. The guidance provided to students ensures smooth progress with research in each subject – not just through guidance provided by instructors, but through exchange with other individuals both inside and outside the university. Students seeking more in-depth study can advance to the doctoral program, where they are expected to develop the skills needed to identify appropriate courses of action for research through more systematic research. With the establishment of the Department of Conservation, the program now awards a doctoral degree in conservation. Recipients of the doctorate are expected to serve active roles in Japanese society as conservation specialists. The results of research undertaken in this studio are presented at various venues and forums, including academic conferences held in Japan and around the world, as well as in studio presentations held each fall. This research is also reported in academic society bulletins and the university gazette. The most recent list of results, including those covered in other publications, is released in the studio’s annual report. The department actively seeks to accept international students. To date, some 60 students have graduated from the Conservation Science studio. Members of the first class of graduates now make significant contributions to the conservation of Japanese cultural assets and play leading roles in conservation efforts. Graduates are currently active in conservation-related university programs and at educational institutions, conservation laboratories, art and other museums, libraries, archaeological research centers, and private-sector restoration facilities. The Preventive Conservation studio began in April 1995 as a series of joint lectures administered with the National Research Institute for Cultural Properties, Tokyo. The studio trains graduates who will go on to work to conserve cultural assets in the 21st century. The field of Preventive Conservation comprises two programs: the Museum Environment Program and the Conservation Materials Program. The first focuses on the environmental conditions required to conserve cultural assets; the latter focuses on the materials used in conservation and restoration. While the studio has not recruited students since the 2005 academic year, it provides training in the conservation of cultural assets in partnership with instructors from other studios through various elective courses. Global Art Practice was established in April of 2016, as part of the Graduate School of Fine Arts at Tokyo University of the Arts (TUA). GAP aims to develop research and human resources with a global focus on social practice in contemporary art, while expanding alternative networks and mutual relationships across borders. With courses taught in English by internationally acclaimed artists and world-class experts, GAP offers a flexibly structured, innovative program, enabling graduate students to fulfill their roles as leading artists and researchers. To build a global perspective that transcends geographical conditions and borders. To gain diverse viewpoints, approaches and understandings of the world by learning various perspectives. Discourse and the hands as the two foundations for thoughts. Independent as well as collaborative learning. Through our Global Art Joint Project, we collaborate with the world’s leading art schools to offer practicums in both Japan and the partnering country. For the 2018-2019 academic year, TUA partners with University of the Arts London, Central Saint Martins(CSM) and École Nationale Supérieure des Beaux-Arts de Paris(BAP). There will be lectures, research, workshops, work production and presentations based on the themes of each unit. The processes and results of the Global Art Joint Curriculum will be updated on the GAP website. Complex Topography: The Pavilion held as part of Folkestone Fringe in parallel with Folkestone Triennale 2017. The Whole and The Part held in parallel with Tokyo Suki Festival 2017. Complex Topography: Movement and Change held at Ritsurin Garden in Kagawa Prefecture as part of Setouchi Triennale 2016. INVISIBLE: In the Eye of the Double Spiral at Château de Chambord. GAP faculty members offer seminars and special lectures based on their respective specialized fields. Started in 2018, ‘ Thinking Using Your Hands ‘ is a seminar where students explore materials and techniques in clepth through object-making.The seminar succeeds the format of GAP practice (woodworking, urushi, textile dyeing, washi/woodblock printing, glass, metalworking, programming, and performance.) which was held until academic year 2017.Through a distinctive process of modernization in Japan, TUA has cultivated a dynamic tradition and techniques in the field of fine art. This course encourages reflection and critical insight on modernization and tradition through practice. Second-year students work on their graduation works, either acombination of artwork and an essay or a thesis. Students set their own goals and work to achieve these goals, as well as present outputs worthy of a degree in master’s level. Art Communication course aims to cultivate the communication skills necessary for each student to engage in cultural exchange and creative practice in a global context. Students learn English language skills at their own level, in addition to preparing and presenting their portfolios in English, and reading and discussing texts on theories that are relevant to contemporary art history. In this series, we invite world-class art professionals and leading experts in the field of contemporary art to offer seminar-style courses and forums on important issues surrounding social practice in a global context. We also offer opportunities for students to meet individually with guest professors. A multifaceted approach to understanding the global context builds a foundation for empathizing with the opinions of others. Through these processes, we help develop the students’ ability to engage in discussions and present their views, while respecting each other’s individuality. Song Dong (artist) *scheduled in autumn 2018. Kobiken (short for Kobijyutsu-kenkyu meaning “classical Japanese art research”), a research trip to the historic cities of Kyoto and Nara, is a long-standing tradition of the TUA curriculum. Students take preparatory lectures about Japanese antiquities such as architecture and buddha statues, followed by the research trip including special admissions, to certain buildings and gardens which are closed public. The research trip provides students with an experience of detailed observation that goes beyond more appreciation beyond mere seeing. Students can take special lectures by prominent scholars in respective fields, which will explore the particular aspects of Japanese culture such as painting, sculpture, craft and design.